Nordic walking: a passion for walking you can live by the sea or in town. 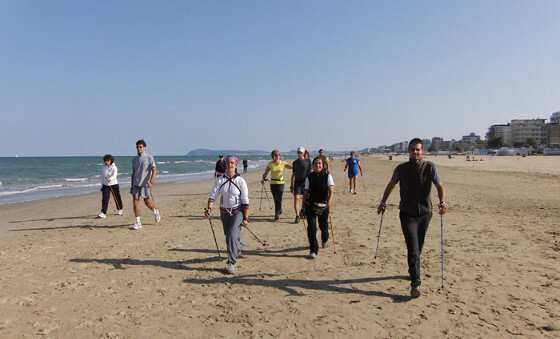 Nordic Walking is becoming increasing popular in Italy and the Romagna region with its long stretches of sandy beach simply could not afford to “lag behind”. So it is not so unusual in most periods of the year to see groups of Nordic Walkers meet on the beach in the early hours of the morning and go from Cattolica to the foot of Mount S. Bartolo. However, the best paths head towards the inland area, towards the enchanting hill tops and medieval villages of Romagna. Thanks to many package deals of a 3 star hotel in Cattolica, you can enjoy a holiday that happily combines outdoor activities along the valleys of rivers Conca and Marecchia, sports by the sea and entertainment on the beach. Nordic Walking outings are organised every day by qualified instructors and also provide a fantastic opportunity to make new friends. The starting point is very close to the hotel and walking sticks can be hired on the spot. 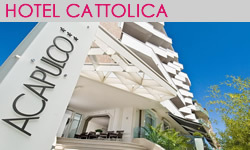 For a wonderful fun active holiday in Cattolica, the Acapulco Hotel has designed special offers for families, all inclusive package deals in spacious modern rooms equipped with all amenities required for unforgettable stays. In the panoramic restaurant of the hotel, families with young children can ask for special menus and flexible meal times to meet their children’ s needs. Last but not least, visiting Cattolica and staying at Acapulco Hotel will provide a wonderful opportunity to arrange day-trips to local theme parks, that can be easily reached by car of public transport.